Skrill, also known as Moneybookers, is a British e-commerce company, which enables its users to make online payments, throughout 200 countries. It is owned by Moneybookers Limited and was established on June 17th, 2001. The term of e-money appeared in 2001 and in April 2002, the service was made available for the public use. Moneybookers enables sending and receiving money from debit or credit cards, bank accounts via e-mail. Opening an account with Skrill is simple: customers need to register their e-mail address and fill in a form with personal details on the company’s website. There are 41 currencies to choose from when opening an account. Customers are further on identified by the e-mail address associated with an account, hence the “via e-mail” type of transaction. One essential advantage that Skrill has to offer its customers, is that transactions are executed immediately and in real time. Moreover, there is no need to constantly give in the details of personal credit cards when making a payment. Skrill is an especially preferred payment method of casino gamblers and sports bettors, since it allows transferring money instantly from your own Moneybookers account to the account of an online bookmaker or a casino. It guarantees reliability and security throughout your gambling experience. Instant money deposits or withdraws. Transactions in a wide range of currencies throughout 200 countries. 24/7 client support in 12 languages. In 2011, Skrill not only was recognized as the organization with the highest growth potential within the European Union, but has also earned the “Best Global Potential Award 2011” and the “Unique Leadership Award 2011”, being the first ever company winning the two awards within the same year. Sign up today! Other than international bank transfers (which are free of charge), payments using the other methods are subject to a 1.90% fee. Transfers may take from 2 to 5 days to be processed, depending on the bank where you are transferring your money from. Customers can withdraw their money in any country that Moneybookers supports, but need to pay 3.50 EUR for a withdrawal via check and 1.80 EUR for every withdrawal to a bank account. The Moneybookers MasterCard is a reloadable prepaid card, which offers the clients a real time access to their digital wallet. That means, you will be able to access and enjoy your funds anywhere and at any time you want – there are more than 35 million high streets and online retailers that accept MasterCard and over 1.9 million ATMs will give you granted access to your funds. Four currencies are available for withdrawal with Moneybookers MasterCard: EUR, GBP, USD and PLN. The ATM withdrawal fee is 1.80 EUR, but using the MasterCard when shopping is free. The foreign exchange fee is 2.49%. The only other cost is a 10 EUR fee per year in maintenance purposes. Just like a bank account, Moneybookers MasterCard offers a full statement, which is available online. The Moneybookers MasterCard is also available in the USA, unlike with other similar payment options. Therefore, Americans are free to place bets on any sports events, using this type of an e-wallet account. Skril is supervised and regulated by the British Financial Services Administration, as well as licensed by 43 American states (some in the process of granting a license), which stresses out the safety level at which this e-wallet operates. The company is compelled to follow an impressive set of rules and regulations regarding consumer protection and risk prevention. State-of-the-art encryption technologies are used in order to prevent frauds and to ensure the highest level of security to their customers. Moreover, Skrill does not reveal any sensitive information, like credit card numbers or your bank account, to any third parties – and not even the persons you are transferring funds to have access to such kind of information. This is why it is considered to be much more secure and reliable than any other money transfer method. You don’t need to put in much effort to start benefiting from one of the best e-wallets available on the Internet – signing up with Skrill is a very simple and fast process. Just follow the instructions and it will not take you more than 4 minutes to start exploring your account! First choose from the types of accounts available: consumer or business account. An individual user needs to fill in a form regarding his/her personal information, while a business needs to add details concerning its sales activity. You also need to decide when opening an account whether you need a Moneybookers MasterCard or not. Sign up at Skrill here! 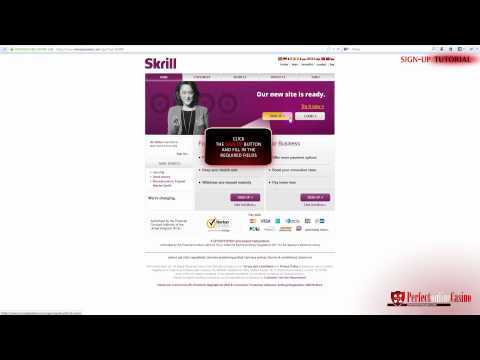 One more strong point of Skrill is the exceptional customer support service they offer. Almost any contact method is supported: e-mails, regular mail enquiries, telephone calls and faxes. Even more: a live chat is available on the website. Day and night, you can reach the customer support and you will, guaranteed, get the fastest reply possible.